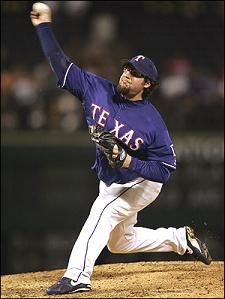 At today’s trade deadline it was the Red Sox and not the Yankees who made the biggest splash by acquiring former Cy Young winner Eric Gagne. This was not the worst or non-move of the day for a team struggling to find bullpen help. If the Yankees were serious about improving their bullpen a single rental player wouldn’t provide much help to a pen which is in dire need of a complete overhaul anyway. The move or non-move that hurt the Yankees the most was their failure to trade away Kyle Farnsworth, Brian Bruney, and Mike Myers along with Scott Proctor who was pawned off to Los Angeles for a utility infielder. These guys make up a bullpen which barely strikes out anyone and walks everyone. 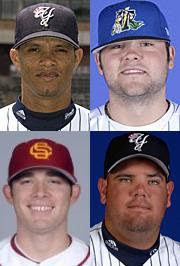 On top of their struggles the Yankees have a crop of younger players in their minor league system who are practically being held hostage: Chris Britton, Edwar Ramirez, Joba Chamberlain, and Ian Kennedy. With the departure of Proctor it is likely that Chamberlain will get called up, but with the BB-Boy crew still around it is unlikely that the rest will get the chance to show their skills at the major league level. The most likely to get promoted first is Joba Chamberlain, who has been recently moved into the bullpen for Scranton Wilkes-Barre in preparation for the job. Joba has thrown 85.1 innings this year with a 2.53 ERA and 128 strikeouts. Chris Britton has had a great season in Triple-A posting a 2.80 ERA while walking only 13 in 45 innings. Britton was briefly on the team and even performed well when used (three times), but despite this was ignored in key spots and eventually sent down for his efforts. Edwar Ramirez has been lighting up the scene for the Yankees minor league affiliates with a 0.59 ERA in 46 innings including 85 strikeouts, but he was called up and did a great job warming the bullpen bench. In Edwar’s first (of three) appearance he came in and struck out the side to end the game. Ian Kennedy has split time from levels A to Triple-A and throughout that time has pitched 117.2 innings while striking out 135 and posting an impressive 1.76 ERA. Kennedy is considered a very good prospect and could see time this season out of the pen as a lefty reliever before taking over his long-term role of starter. So despite the Yankees not getting Gagne today, the biggest concern right now isn’t who is going to pitch in the 8th inning, but, is Torre going to keep using Farnsworth in every game where the Yanks have a chance to win? Hopefully, starting with Joba Chamberlain, the Yankees will begin giving their younger players a chance. After all, somebody has to eat up all the innings that Proctor used to pitch. For more deadline news checkout Hot Stove NY.